Are you looking for something that can redecorate your house and fireplace in amazing look? Make a search for stone veneer fireplaces a special kind of stone that used for especially home and fireplace decoration. Fireplace is a special place in the home that adds warmth and an elegant touch to a room decoration and also a center place where family members and friends gather to relax and converse. In this way this place reflects the sense of warmth, charm, comfort and luxury so to increase its beauty veneer stone decoration is perfect for it. Stone veneer for fireplace is man made stone molded from real stones that give your fireplace a natural, beautiful appearance and also can be used for other walls in your home and for flooring to enhance your home look in completely amazing ways that stuck all heads. Stone veneer works to fulfill your desire of having an elegant home decorated according to new running trend. 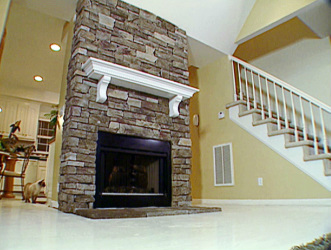 Installation of stone veneers is simple that give you natural look as soon as possible without consuming extra time. To find best kind of stone veneer fixing or installing make visit to North Star Stone. There you find best kind of service options and charges in your budget. North Star Stone can offer you best kind of realistic, beautiful and versatile veneer stone that create wonders in appearance of house designing. Veneer stone is flexible and versatile stone unmatched by natural stone. This stone is very lighter in weight and molded in any shape so there is no need of extra support and making so much wall breaking. In this way you find best kind of designing work in very short time.